These pieces are made with raw fleece, embellished with locks, hand spun yarns, silk fiber, and more! They are free form, and beautifully textured. 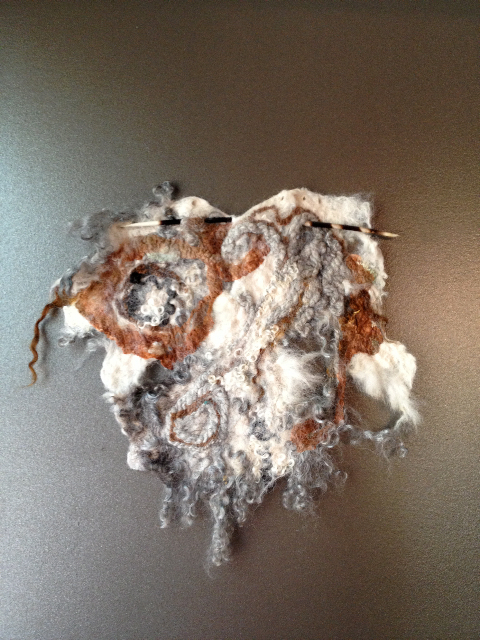 You will learn a quick and easy way to felt, and come away with new skills, as well as a unique wall hanging! Wool and the supplies needed to felt will all be provided. Students are encouraged to bring yarn, hand spun and otherwise, silk fiber, dyed bits etc. to embellish your design, and there will also be some of those items available as well. Just bring a couple of towels, and the urge to felt! Please RSVP if you plan to come so we know how many students to expect.